In case you missed it, Siete Foods launched 3 flavors of paleo-friendly tortilla chips this month and let’s just say Mexican food is officially changed forever. I’ve known about the launch of these chips for several months, but had to keep my mouth shut, which let me tell you, was really, really hard. As far as I know there are no other paleo-friendly tortilla chips on the market, so these are LONG overdue. They come in Nacho, Lime and Sea Salt and each one is spectacular. One of my all-time favorite dishes that uses tortilla chips is Chilaquiles, but until now, I had to settle for corn chips. 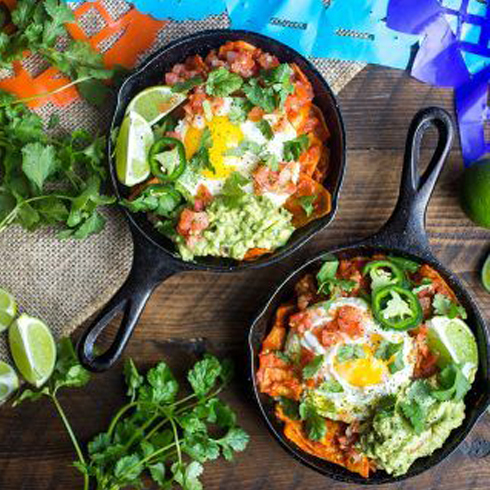 When these chips arrived at my doorstep I knew the very first recipe I had to make was Paleo-Friendly Chilaquiles! This recipe makes two portions, but you will absolutely have leftover red chili sauce. I suggest making more than one batch of these or use them for anything else you’d like… Enchiladas with Siete’s grain-free tortillas perhaps?! One more note is that this recipe does not contain cheese, which is traditional for this dish. I don’t eat dairy and find that the guacamole is more than enough to give these the creaminess they need, but if cheese works for you, feel free to add it! Soak dried chiles in a pot of boiling water for 15 minutes. While the chiles boil, roughly chop the jalepeno, removing the stem and seeds. If you want this dish spicy, keep the seeds. Roughly chop the onion and garlic. Place diced tomatoes, onion, garlic, jalapeño, avocado oil, honey and salt and pepper in a high-speed blender. Prep the pico de gallo and guacamole. When the chiles are done boiling, strain them and run cold water over them so they are safe to handle. With your hands, remove the stems and seeds. Place chiles in the blender and puree until smooth. Add red chile sauce to the same pot you boiled the chiles in to heat up. 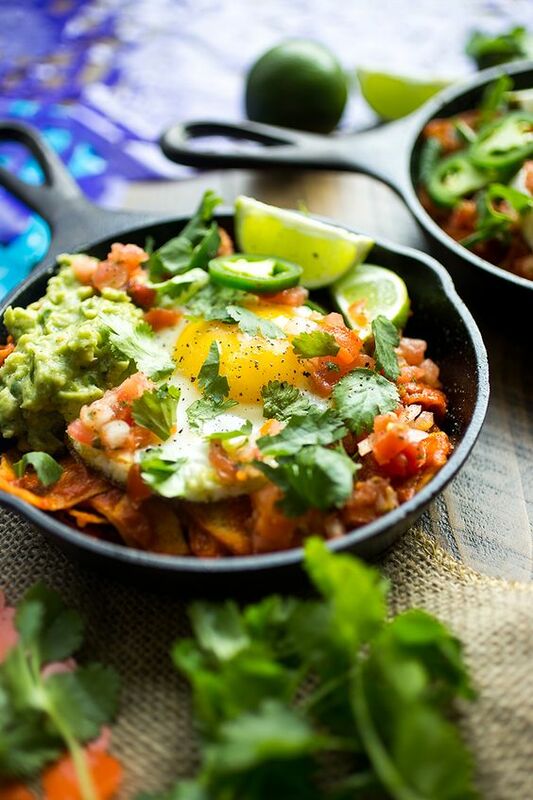 Once red chili sauce is heated and eggs are done, pour about half the sauce over the tortilla chips in a large bowl. Carefully mix the chips in the bowl so that they are coated in chili. 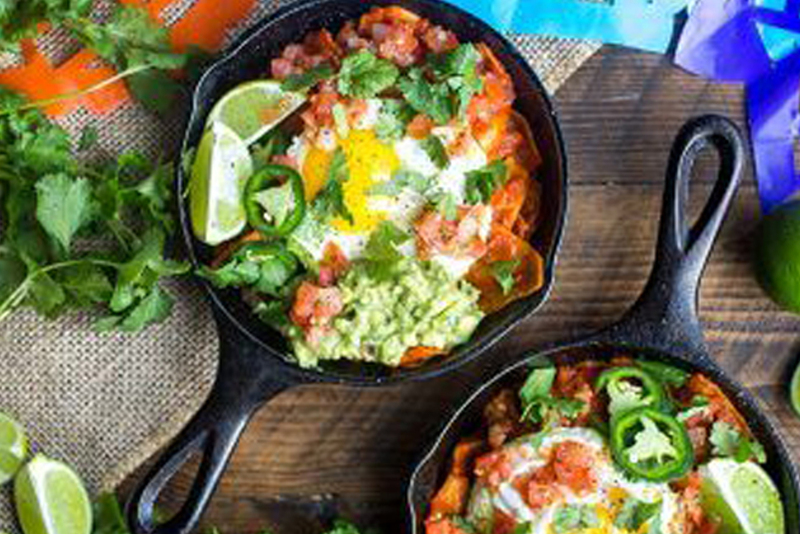 Cook the eggs by adding a tablespoon of avocado oil to a skillet and cooking over medium. Start plating by adding chips first, followed by the egg, pico, guacamole, cilantro and lime wedges. YES! I cannot wait to try these chips! I love the Siete tortillas, which I found thanks to you. Yesterday I tried to make your cassava flour tortillas and somehow they didn’t come out quite right so I will keep using the Siete tortillas. Thanks for this recipe! So glad that you love Siete, but bummed that the homemade tortillas didn’t work out for you. In what way didn’t they turn out? And, you’re welcome for the recipe! !